ROCKFORD, IL. 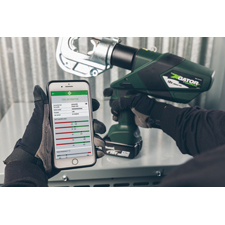 (October 24, 2018) – Emerson (NYSE: EMR) today announced the launch of the Greenlee i-press battery tool monitoring smartphone app. The new i-press app allows crews to track their Next Generation Greenlee Gator® Tools. Using the simple navigation display, workers can view the battery charge, last service date, last five pressure measurements, tool temperature and the number of cycles completed with a connected tool. Users can create a project within the i-press app to save and combine crimping operation data and track tool performance. When the project is complete, an overview report is generated and sent as a PDF. In addition to the new i-press app, Greenlee will continue to provide factory service solutions for battery-powered tools from their locations in Rockford, IL and Chattanooga, TN. Professional service experts provide preventative maintenance, comprehensive assessments, and certified tool testing to quickly get tools back in safe working order. The new i-press app replaces the Greenlee Gator Eye App and is now available and can be downloaded for free from the App Store or Google Play. For more information click here or visit www.Emerson.com. Greenlee is part of Emerson’s professional tools business, which includes RIDGID as well as the Klauke brands acquired in 2018. Emerson’s professional tools offering provides the industry’s broadest portfolio of advanced, reliable tools and technologies for the mechanical, electrical and plumbing trades globally. Visit Emerson.com/ProfessionalTools for more information. Emerson (NYSE: EMR), headquartered in St. Louis, Missouri (USA), is a global technology and engineering company providing innovative solutions for customers in industrial, commercial, and residential markets. Our Emerson Automation Solutions business helps process, hybrid, and discrete manufacturers maximize production, protect personnel and the environment while optimizing their energy and operating costs. Our Emerson Commercial and Residential Solutions business helps ensure human comfort and health, protect food quality and safety, advance energy efficiency, and create sustainable infrastructure. For more information visitEmerson.com.